The First Baptist Church of Rockland is abounding with rich history dating back to its inception in 1854. With 22 charter members Rev. 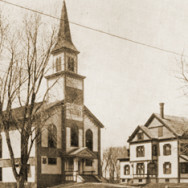 Horace T. Love became the first pastor of what was then known as the First Baptist Church of East Abington, MA. The church building was constructed in 1856 on land donated by Deacon George W. Chipman of Boston. In the mid-1870s the town of East Abington became known as Rockland, MA. In 1892 a parsonage was built next door to the church building but has since been torn down making way for the existing parking lot. In December 1897 the church became incorporated under the laws of the Commonwealth of Massachusetts. On November 11, 1918 the church bell was rung proclaiming that an armistice had been signed ending World War I. At the close of World War II services of Thanksgiving and Praise were held at the church on May 5, 1945 (V-E Day) and again on August 14, 1945 (V-J Day) marking the dates that hostilities ceased and victory was declared in Europe and Japan. It is interesting to note that members of First Baptist Church of Rockland have served their country in every major war involving the United States since the inception of the church. Local business man A.W. Perry was one of the prominent members of First Baptist Church and in 1922 Mr. Perry donated an Estey pipe organ in memory of his beloved wife, Isadore French Perry. Later that same year Mr. Perry donated the antique clock which now sits at the base of the belfry at 200 Union Street. In 1950 a severe windstorm from the southeast dislodged the weather vane from the church steeple causing serious damage to the north roof of the building. In the spring of 1951 the church voted to replace the weather vane with a cross at the top of the steeple. The cross still points people to the Savior until this day. First Baptist Church has always had a heart for missions and has supported numerous home and cross cultural missionaries for more than sixteen decades. The Rockland church has also given birth to at least three local churches in its lifetime. In 1886, under the pastorate of Rev. A.E. Woodsum, thirteen church members were sent out to assist in the forming of the Baptist Church in North Abington, MA. More recently, under the pastorate of Rev. Fred Boothman, III two more churches have been planted; Igreja Batista em Rockland under the leadership of pastor Marcone Coreia and LifeSong, a contemporary church serving the next generation under the leadership of Pastor Scott Dube and Worship Pastor Fred Boothman, IV. Both churches share the facility at 200 Union Street in Rockland with Pastor Jay Witham and the First Baptist Church.